On your Giverny Tour, you will get to explore the quaint French village located just a few miles west of Paris that was made famous by the impressionist legend Claude Monet. It was in the enchanting village of Giverny that inspired Monet to paint his most famous works, including his legendary water lily series. Your tour of Giverny begins with your efficient train ride, which takes you through the charming French countryside to Giverny. Upon arriving in Giverny, you’ll explore the Giverny Impressionist Museum, which is home to significant Impressionist pieces, inspired by Monet. You’ll then tour Monet’s home, which has just undergone a loving 10-year restoration project to bring it back to its former glory. You’ll get to discover the actual places where he created his work, and lived with his female companion, her six children, and their two sons. 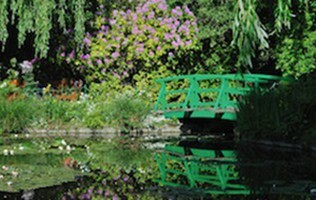 After that, you’ll tour Giverny’s gorgeous gardens and meander over the historic Japanese bridge that appears frequently in his most famous paintings. Monet’s gardens were his true indulgence, and are a joy to behold. Entry fees are not included with our Giverny Tour. Entry fees are â‚¬9.50 per adult, and â‚¬5 for children and students. 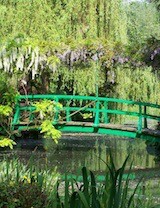 What will I see on my Giverny Tour? You will explore Monetâ€™s home, and the wonderful gardens that inspired him. How will we get to Giverny? 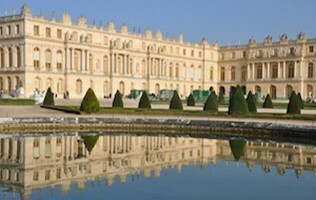 Usually you and your guide will travel to Giverny via the efficient Paris train. The ride takes about 45 minutes. How much are the train tickets to Giverny? Your guide for your Private Giverny Tour will meet you at your predetermined spot â€“ usually right in your hotel lobby or outside your apartment. But of course, your meeting point is up to you!